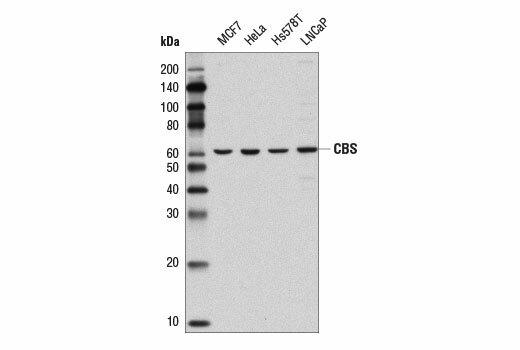 Western blot analysis of extracts from various cell lines using CBS (D8F2P) Rabbit mAb. 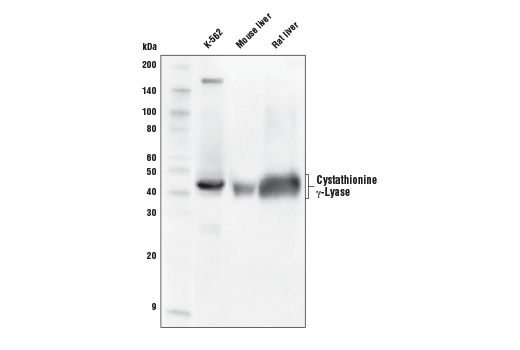 Western blot analysis of extracts from K-562 cells, mouse liver, and rat liver using Cystathionine γ-Lyase (D1N1D) Rabbit mAb. 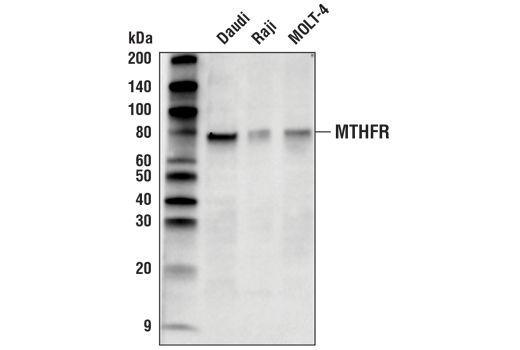 Western blot analysis of extracts from Daudi, Raji, and MOLT-4 cells using MTHFR (D1E4V) Rabbit mAb. 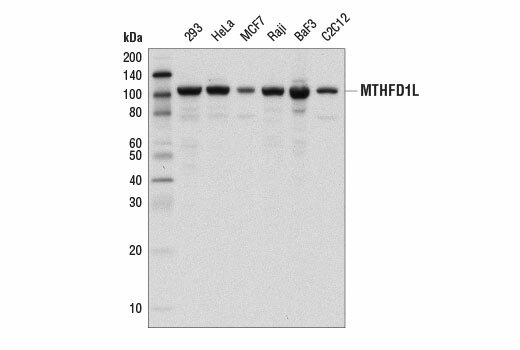 Western blot analysis of extracts from various cell lines using MTHFD1L (D8T7L) Rabbit mAb. 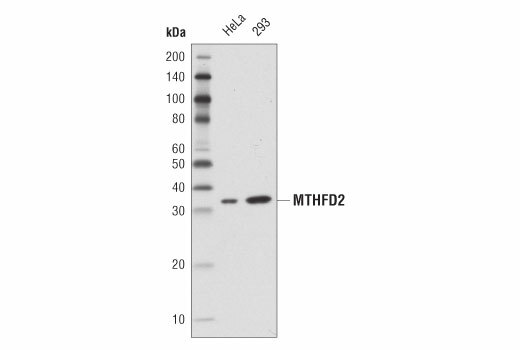 Western blot analysis of extracts from HeLa and 293 cells using MTHFD2 (D8W9U) Rabbit mAb. Western blot analysis of extracts from various cell lines using SHMT1 (D3B3J) Rabbit mAb. 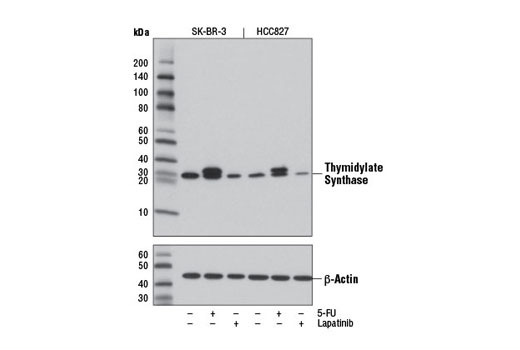 Western blot analysis of extracts from SK-BR-3 and HCC827 cells, untreated or treated with 5-FU (1 μM) or lapatinib (1 μM) for 24 hr, using Thymidylate Synthase (D5B3) XP® Rabbit mAb (upper) or β-Actin (13E5) Rabbit mAb #4970 (lower). 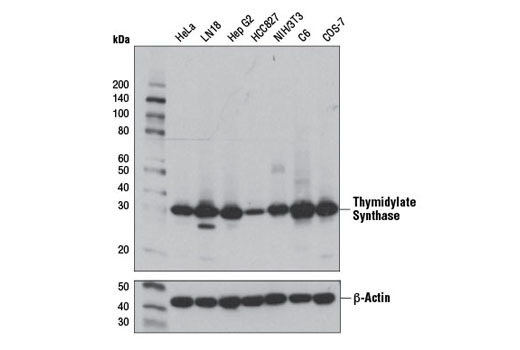 Western blot analysis of extracts from various cell lines using Thymidylate Synthase (D5B3) XP® Rabbit mAb (upper) or β-Actin (D6A8) Rabbit mAb (lower) #8457. 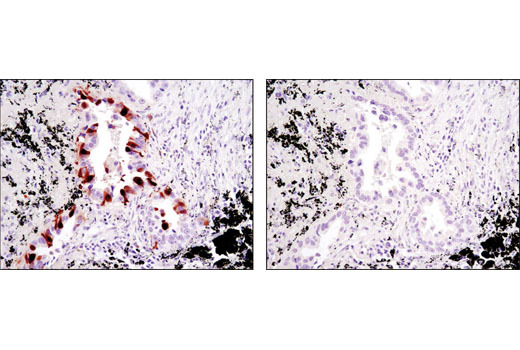 Immunohistochemical analysis of paraffin-embedded human lung carcinoma using Thymidylate Synthase (D5B3) XP® Rabbit mAb in the presence of control peptide (left) or antigen-specific peptide (right). 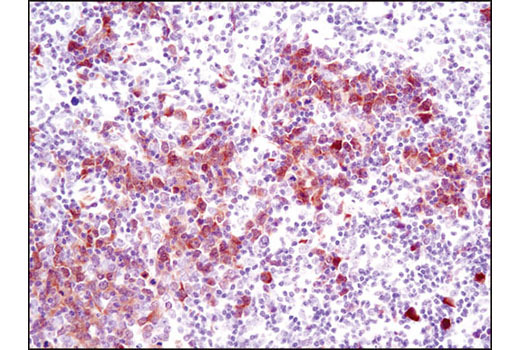 Immunohistochemical analysis of paraffin-embedded human lymphoma using Thymidylate Synthase (D5B3) XP® Rabbit mAb. 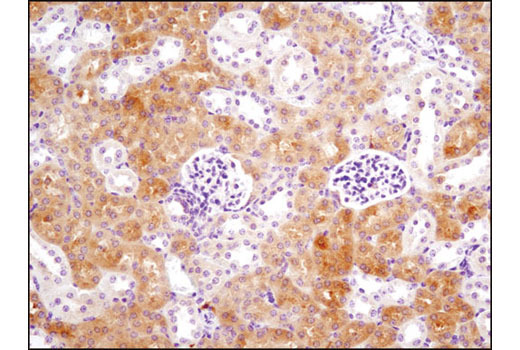 Immunohistochemical analysis of paraffin-embedded mouse spleen using Thymidylate Synthase (D5B3) XP® Rabbit mAb. 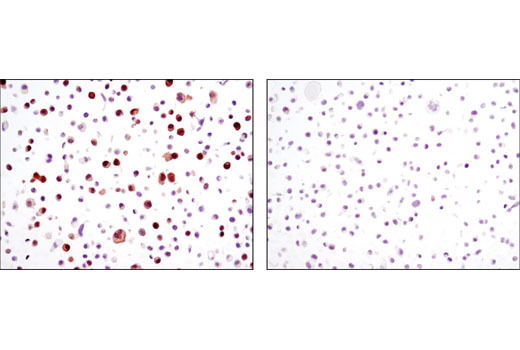 Immunohistochemical analysis of paraffin-embedded SK-BR-3 cell pellets, untreated (left) or treated with LY294002 #9901 (right), using Thymidylate Synthase (D5B3) XP® Rabbit mAb. 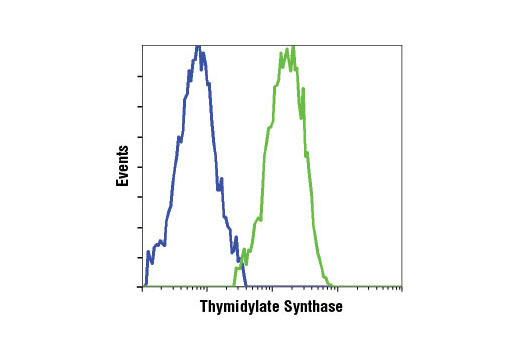 Flow cytometric analysis of HCC827 cells (blue) and HeLa cells (green) using Thymidylate Synthase (D5B3) XP® Rabbit mAb. 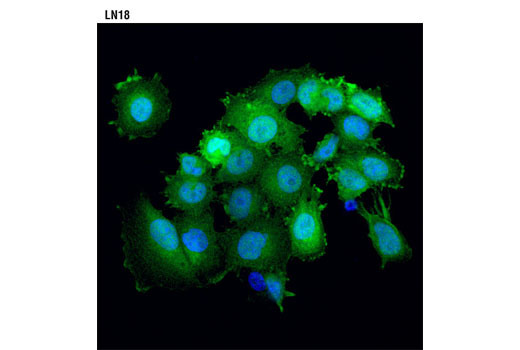 Confocal immunofluorescent analysis of LN18 cells using Thymidylate Synthase (D5B3) XP® Rabbit mAb (green). Blue pseudocolor = DRAQ5® #4084 (fluorescent DNA dye). The One-Carbon Metabolism Antibody Sampler Kit provides an economical means of detecting select components involved in one-carbon metabolism pathway. The kit contains enough primary antibodies to perform at least two western blot experiments per antibody. Each antibody in this kit recognizes endogenous levels of its specific target protein. 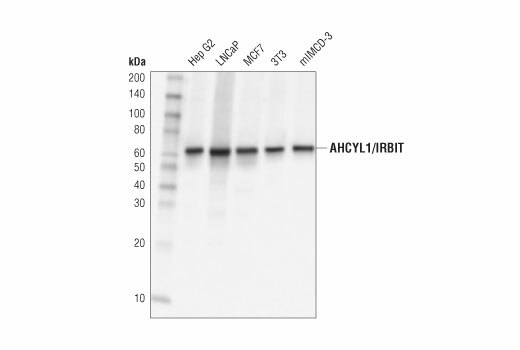 AHCYL1/IRBIT (D3A5G) Rabbit mAb does not cross-react with AHCYL2/IRBIT2 protein. 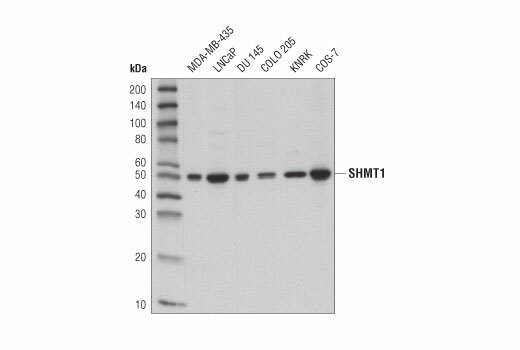 SHMT1 (D3B3J) rabbit mAb does not cross-react with SHMT2 protein. Monoclonal antibody is produced by immunizing animals with a synthetic peptide corresponding to residues surrounding Glu50 of human AHCYL1/IRBIT protein, Leu220 of human CBS protein, Pro298 of human cystathionine γ-lyase protein, Pro39 of human MTHFR protein, Ala264 of human MTHFD1L protein, Leu340 of human MTHFD2 protein, Glu187 of human SHMT1 protein, and residues near the carboxy terminus of human thymidylate synthase protein. One-carbon metabolism includes various enzymatic reactions involving the transfer of one-carbon groups mediated by folate cofactor (1). The activated one-carbon groups are used by various metabolic pathways, including purine synthesis, thymidine synthesis, and remethylation of homocysteine to methionine (1). S-adenosylhomocysteine hydrolase-like protein 1 (AHCYL1) is a member of the S-adenosylhomocysteine hydrolase family, which participates in the metabolism of S-adenosyl-L-homocysteine (2). Cystathionine beta-synthase (CBS) is a key enzyme involved in sulfur amino acid metabolism as it catalyzes the formation of cystathionine from serine and homocysteine (3,4). Cystathionine γ-lyase (CGL) is an enzyme in the transsulfuration pathway, a route in the metabolism of sulfur-containing amino acids (5). Methylenetetrahydrofolate reductase (MTHFR), a key enzyme in one-carbon metabolism, catalyzes the conversion of 5,10-methylenetetrahydrofolate to 5-methyltetrahydrofolate (1). 5-methyltetrahydrofolate donates its methyl group for remethylation of homocysteine to methionine (1). Methionine is further converted to S-adenosylmethionine (SAM), a major reactive methyl carrier (1). NADP+ dependent methylenetetrahydrofolate dehydrogenase 1-like (MTHFD1L) is a mitochondrial enzyme that catalyzes the production of formate from 10-formyl-tetrahydrofolate in one-carbon flow from mitochondria to cytoplasm (6,7). MTHFD2 is a bifunctional methylenetetrahydrofolate dehydrogenase/cyclohydrolase involved in mitochondrial folate metabolism (8). Serine hydroxymethyltransferase 1 (SHMT1) is a cytoplasmic serine hydroxylmethyltransferase (9,10). It catalyzes the conversion of serine to glycine with the transfer of β-carbon from serine to tetrahydrofolate (THF) to form 5, 10-methylene-THF (9, 10). The methylation of deoxyuridine monophosphate (dUMP) to deoxythymidine monophosphate (dTMP) is an essential step in the formation of thymine nucleotides, a process catalyzed by thymidylate synthase (TS or TYMS) (11-13). Ducker, G.S. and Rabinowitz, J.D. (2017) Cell Metab 25, 27-42. Banerjee, R. and Zou, C.G. (2005) Arch Biochem Biophys 433, 144-56. Jhee, K.H. and Kruger, W.D. Antioxid Redox Signal 7, 813-22. Chiku, T. et al. (2009) J Biol Chem 284, 11601-12. Prasannan, P. et al. (2003) J Biol Chem 278, 43178-43187. Prasannan, P. and Appling, D.R. 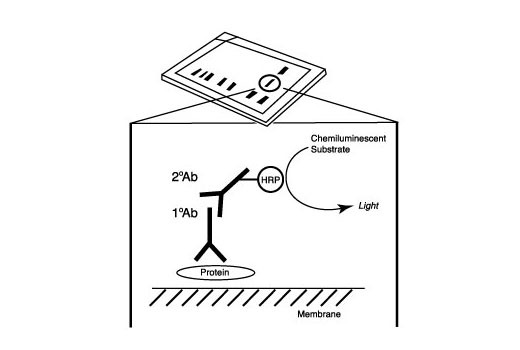 (2009) Arch Biochem Biophys 481, 86-93. Christensen, K.E. and Mackenzie, R.E. (2008) Vitam Horm 79, 393-410. MacFarlane, A.J. et al. (2008) J Biol Chem 283, 25846-53. Hebbring, S.J. et al. (2012) J Neurochem 120, 881-90. Johnston, P.G. et al. (1991) Cancer Res 51, 6668-76. Aschele, C. et al. (2002) Ann Oncol 13, 1882-92. Jackman, A.L. and Calvert, A.H. (1995) Ann Oncol 6, 871-81.